A groundbreaking and ambitious new initiative, led by the Creative Diversity Network (CDN) and backed by the BBC, Channel 4, ITV, Sky, Channel 5/Viacom, ITN, Pact and the Department for Work and Pensions (DWP), aims to double the percentage of disabled people working in British television by 2020. 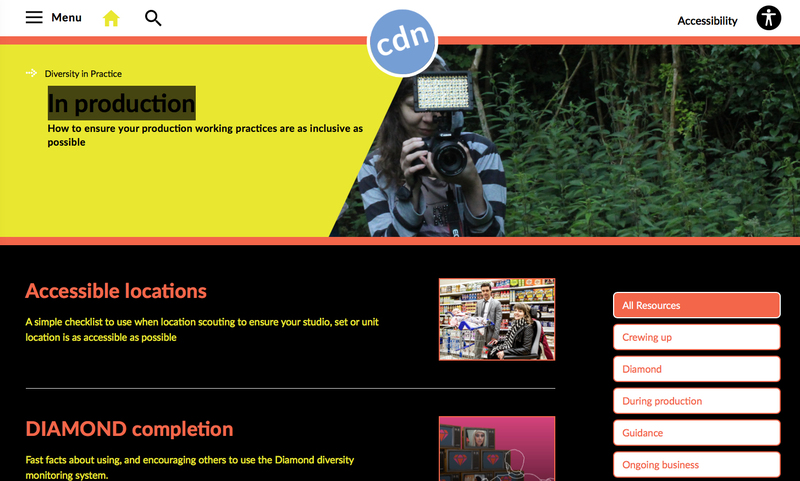 Reports for CDN’s DIAMOND diversity monitoring system show real concern about the continuing low numbers of disabled people working both on and off screen. The most recent figures suggest that just 4.5 per cent of those working off-screen in the UK’s television industry have self-declared as disabled, compared to the 18 per cent figure for the population as a whole. Just 4.1 percent of senior roles were filled by disabled people. Just 5.0 per cent of off-screen contributions were from disabled people. The representation of disabled people varied by genre. For example, for drama (1.9%), comedy (2.2%) and arts and music (figures too low to report), there are fewer than 3 per cent contributions by disabled people. The highest number of contributions were to current affairs (12.1%) and childrens (9.3%). The Doubling Disability initiative is creating an executive cross-broadcaster taskforce, with involvement from the DWP, disabled people’s organisations and other bodies, with the aim of doubling the percentage of disabled people working in off-screen production and creative talent roles over the next two years. It includes a research programme which will identify barriers to employment and, working at the highest level within the industry, seek remedies that can be shared across the industry. The project will work across and through the supply chain – broadcasters, producers, freelancers, industry bodies such as guilds, unions and training providers – to increase the number of disabled entrants to new and existing roles, as well as supporting the retention and career progression of disabled people already working in the industry. It is targeted at increasing disabled representation in all off-screen roles across commissioning, production and programme support functions. It includes training and introduction programmes for employers and individual contractors, as well as disabled people’s organisations working to get more new people into the industry. CDN will also be working closely with the DWP to look at making it easier for both employers and individuals to access funding through the government’s Access to Work scheme, to help make the reasonable adjustments which increase the accessibility of workplaces and jobs to disabled people. Doubling Disability will use the most recent DIAMOND report as a benchmark, and then monitor and capture the project’s progress and achievements through subsequent DIAMOND reports. Figures from Diamond: The First Cut (Update) published in May 2018, and covering programmes transmitted August 2017 – July 2018. The Creative Diversity Network (CDN) exists to inspire, encourage and support the UK television industry to expand diversity and inclusion. It is a UK television industry body, largely paid for by its members who are: BAFTA, BBC, Channel 4, Channel 5/Viacom, Creative Skillset, Pact, ITN, ITV, Media Trust, S4C, Sky and Turner Broadcasting.